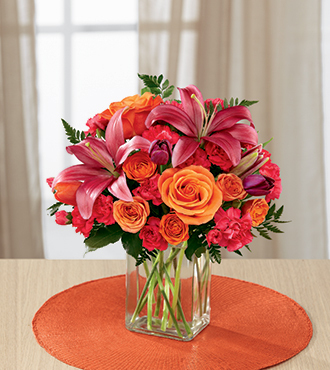 Like a brilliant sunrise, the FTD® Always True™ Bouquet blossoms with radiant color. Whatever the occasion, this bright ensemble of orange roses, hot pink Asiatic lilies and mini carnations, purple and orange tulips, orange spray roses and lush leatherleaf fern is a showstopper. Delivered fresh in a contemporary rectangular glass vase, this bouquet is an ideal birthday, thank you, anniversary, or Valentine's Day gift. Marking an extra special occasion? Make it unforgettable with a plush stuffed bear, a gourmet box of chocolates or one of our other optional bonus gifts.